Creating a PDF is safer in many cases, for example, if a document file needs to be given to many people who might be running different platforms, a PDF would offer a unified way to read the document just as it was created. However, editing a PDF file is troublesome because simply copy-pasting the texts into an empty Word or .txt file would not work, the text formatting would get all scattered and some fonts might not even get recognized. iSkysoft PDF Editor Pro for Mac is a utility software that solves this problem by offering extensive PDF editing features. Since good stuff comes for a price, the iSkysoft PDF Editor Pro for Mac software had to have a price tag as well. If you had been looking for the best PDF editor software on Macintosh platform, you now have a name. Mark up and annotate PDF: You can add multiple markups and annotation tools like highlight, underline, strikethrough. So you can easily mark up PDF and let the receiver know your thoughts. For the added annotations, you can freely to show or hide the annotation in your PDF documents. Convert and create PDF: You can create PDF files from existing PDF files, web pages, images, EPUB and any form of texts within minutes. You can also convert a PDF file to several output formats such as; Word, PowerPoint, Excel, HTML, EPUB, Rich Text, Plain Text, and images while retaining its original layout. Secure PDF: You can not only add password and permission to your PDF but also place custom stamps and e-signatures onto your documents. You can also add batch watermark PDF or remove watermarks from your PDF. Fill out and create PDF forms: Forms are a crucial part of any online business or data collection activity. 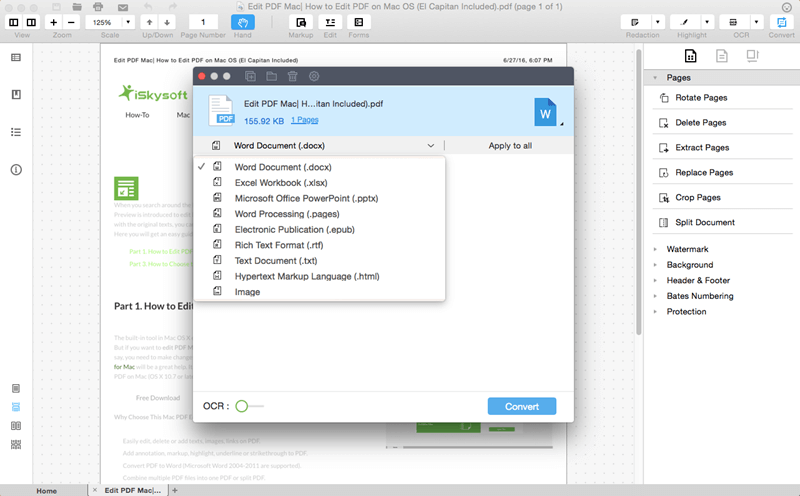 Using iSkysoft PDF Editor Pro for Mac, anyone can create edit PDF forms too. But what’s special is that you can not only fill PDF forms but also import/export PDF forms data to fill out PDF forms quickly and easily. Share PDF: You can share files with your friends and family while using this software. Print PDF within the program with customized print options, attach PDF files to your email or upload the PDF file directly to Dropbox. Mac or MacBook computers offer plenty of options for productivity, and with iSkysoft PDF Editor Pro for Mac one could certainly boost up their genius vibes on the go.